News, match reports and everything you need to know about Lanark United. Lanark are in Central League Cup action on Wednesday night against Lesmahagow, the game will be played at Tileworks Park, Stonehouse with Lesmahagow's issues with their home own ground. Also of interest to Lanark will be the fixtures in the Central District First Division, particularly Maryhill taking on Cambuslang. On Saturday we face Shettleston away from home in the league. Lanark play Forth Wanderers for a place in the final of the Clydesdale cup against Carluke or Lesmahagow. The game takes place at Kingshill Park, Forth with a 7pm kick off. Forth will be keen to make up for a disappointing 5-1 defeat to Whiteford Amatuers in their first friendly fixture. Forth have an excellent website, click here to view it. Ian has kindly let me use a few pictures from his site of Forth's recent matches. He's also said he'll let me know if the game is in any doubt due to the adverse weather. Finally back in action tomorrow before the new league campaign. Lanark welcome Stoneyburn Juniors to Moor Park for a friendly, a chance for fans to see what the situation is after inevitable comings and goings over the summer, Lanark then travel to Forth for a Clydesdale cup game on Monday evening..
Also planning to keep the site much more up to date his season, struggled last year as I was usually working Saturday nights straight after the matches but Monday to Friday now so no excuses. The contributions from others, Stevie posting fixtures, Graeme with pictures, Brian with news and everyone else who have commented and even visited the site are much appreciated. The site has only been going for 7 months or so but think it has been going well so far. 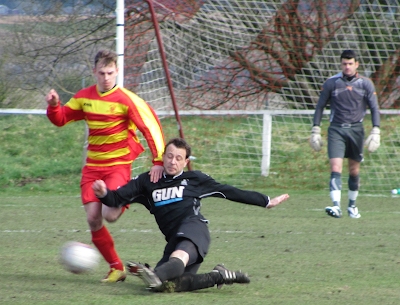 Lanark will be hoping to start 2012 with a good result at home to Hurlford with a 13:45 kick off. 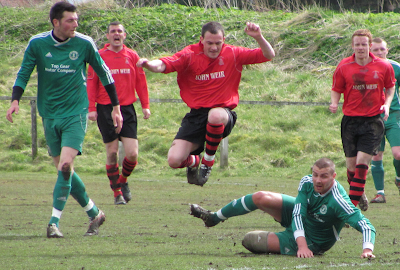 After a disappointing 2011, Lanark find themselves at the wrong end of the table. The story of this season has been a solid defence but a team desperately short of goals, hopefully this will change starting tomorrow. As far as im aware game looks like it will go ahead but if it is called off news will be on here as soon as it is known. Lanark will make surely one of their furthest ever trips for a match to play Nairn St Ninain in the Scottish Junior Cup this Saturday. The map below shows the scale of Lanark's near 200 mile journey. Nairn St Ninian play in the SJFA North Division Two, i've found info on their squad or league placement hard to come by but i'll keep looking. Their last result was a 3-1 defeat away to Portgordon although they won their two games prior to that. Nairn play at the Showfield Park and wear maroon and blue kits. I've managed to find some pictures of the park and some shots from one of their recent games, a 3-0 home win over Cruden Bay. Showfield park looks a tidy, if basic ground. Last I knew of, there were still seats available on the bus at £10 each, contact Stevie if you're interested. Click here to send him a message. You'll need to sign up to do so, if you havent already. Lastly, i wont be able to go due to work, if anyone who is going wouldnt mind texting me the score so i can post it up it would be much appreciated. Send me a message if you can help me out. Pictures of players were from this Blog about all things Nain. Lanark play Thorniewood United at Robertson Park this coming Saturday (19th) with a 2:00pm kick off. Lanark will be hoping to build on last week against Glenafton, a game from which they earned a point but had plenty of chances to kill the game before Glenafton equalised. Thorniewood meanwhile will be on a high after winning their last three league games by a margin of one goal. Lanark will have to do without the services of Chris Seenan and Ross Fletcher after both recieved red cards as substitutes in the game last week. I also understand Lanarks talismanic midfielder Alan McCrum's involvement is likely to be lessened over the next few weeks due to work commitments. As mentioned above the game will be played at Robertson park in Uddingston. David from the Thorniewood website has kindly given me permission to use some of his pictures. You can find David's excellent site HERE. It is a good read, with plenty of well written content. Below are some pictures which David kindly supplied me with, the first three offer several views of Robertson Park, the second three are the players David sent pictures of when i asked about a few of their "Key" players, they are from L-R, Jon Connolly (GK), Steven Maguire (Forward) and Steven Mullen (Forward). Lanark will play away at Annan in a friendly this Tuesday night. Annan are currently top of the Scottish third division and drew 0-0 away to Clyde on Saturday. Lanark will fancy their chances against league opposition after last months 2-1 win at Airdrie. Annan's website can be found HERE. This site is entirely unofficial, the views expressed do not represent those of Lanark United Football Club.